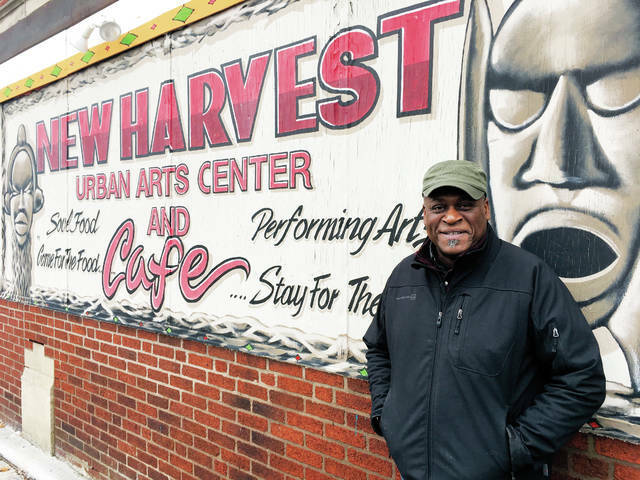 In this Monday, Dec. 18 photo, Columbus community activist Kwodwo Ababio stands outside his New Harvest Urban Arts Center and Cafe in Columbus, Ohio. The city’s soaring homicide rate hit home for Ababio recently when a former foster son was shot and killed. COLUMBUS — Earlier this month, with homicides at a near-record high in Ohio’s capital and biggest city, the Columbus police chief declared a “call for action, and a call for peace” in hopes of reducing the killing. “This holiday season is one of those where we hope for peace, but we can bring about peace, I believe, by engaging everyone and trying to solve these problems,” Chief Kim Jacobs said on the afternoon of Dec. 11. An hour later, a 29-year-old man was shot to death on the city’s south side. Two days later, someone in a car shot at people attending a vigil for that victim, killing one man and injuring three other people, including a 9-year-old girl. Police have tallied 138 homicides this year in Columbus, just shy of the all-time record of 139 in 1991 as the nation’s crack cocaine epidemic was underway. The number has soared above last year’s 106 killings and the 96 in 2015. One of this year’s deaths occurred Dec. 21 but involved a woman dying from injuries sustained in a 2014 shooting. Jacobs attributes the increase to more illegal guns on the street and the use of more powerful weapons — meaning more shots fired during crimes — the impact of the opioid epidemic and people turning to guns to solve arguments instead of less lethal means. Lack of cooperation from witnesses, always a problem, seems to be getting worse, she added. Columbus’ overall homicide rate is actually down from 1991 because of the city’s population growth. Columbus is now the country’s 14th largest city. In Cleveland, the city’s 125 homicides to date are running behind last year’s figure of 135. But recent street corner gun battles have so alarmed some officials that they’re calling for drastic action: Ohio Highway Patrol officers to supplement Cleveland officers. A Cleveland councilman says eight men shot it out with automatic pistols and an assault rifle the evening of Dec. 19, injuring two of the shooters and a 7-year-old girl in a nearby car. “When groups of young thugs feel they can stand on a busy corner and brazenly shoot at one another without regard for citizens or the police, something is terribly wrong,” said Councilman Michael Polensek. Indianapolis set a new homicide rate earlier this month with 150 killings, or one more than all of 2016. Baltimore has recorded 335 killings so far this year. The highest per-capita homicide rate in Baltimore’s history was the 344 killings recorded in 2015. But in New York, the city of 8.5 million people had recorded just 278 killings by mid-December. That puts it on pace to end this year with killings down 14 percent from last year. Lower overall rates are small comfort to communities reeling from high homicide numbers, said Ames Grawert, counsel with the New York City-based Brennan Center’s Justice Program. “It also explains why the 280 homicides we’re projecting in New York feels a lot different than the 260 in Detroit,” he said. Detroit’s population is about 673,000. For Columbus community activist Kwodwo Ababio, the city’s killing spree took a personal turn. Earlier this fall, Ababio, 57, was at a vigil for a woman whose body was found in a burned-out garage. There, he saw 30-year-old James Willis, a former foster son. A few days later, Willis was shot during an apparent argument over drugs. He got in his car to drive himself to the hospital but never made it. The homicide remains unsolved. The young man’s death “really hit home with me,” said Ababio, who runs New Harvest Cafe, a soul food restaurant in a tough north side Columbus neighborhood.